The oldest hominid discovered to date in Ethiopia is the 4.2 million year old Ardipithicus ramidus (Ardi) found by Tim D. White in 1994. The most well known hominid discovery is Lucy, found in the Awash Valley of Ethiopia’s Afar region in 1974 by Donald Johanson, and is one of the most complete and best preserved, adult Australopithecine fossils ever uncovered. 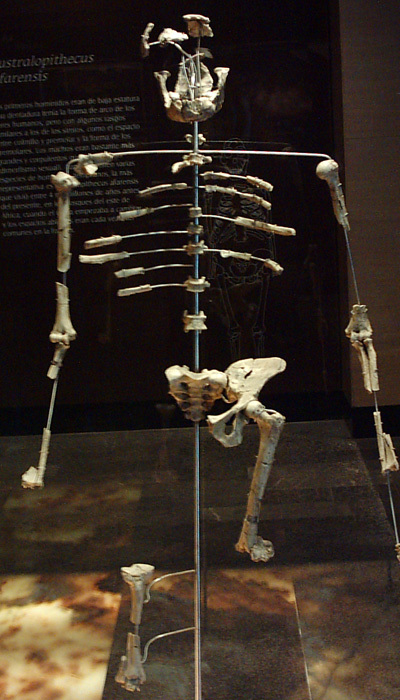 Lucy’s taxonomic name, Australopithecus afarensis, means ‘southern ape of Afar’, and refers to the Ethiopian region where the discovery was made. Lucy is estimated to have lived 3.2 million years ago. Ancient Greek historians such as Herodotus and Diodorus Siculus used the word Aethiopia (Αἰθιοπία) to refer to the peoples living immediately to the south of ancient Egypt, specifically the area now known as the ancient Kingdom of Kush, now a part of modern Nubia in Egypt and Sudan, as well as all of Sub-Saharan Africa in general (Aethiopia roughly translates to “country of burnt faces,”). 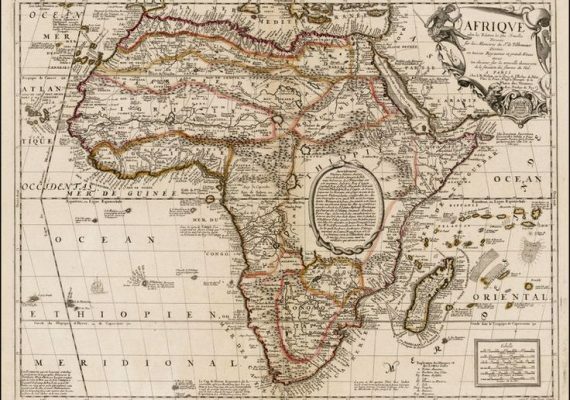 In ancient times the name Ethiopia was primarily used to refer to the modern day nation of Sudan based in the upper Nile valley south of Egypt, also called Kush, and then secondarily in reference to Sub-Saharan Africa in general. Earlier inscription of Ezana Habashat (the source for “Abyssinia”) in Ge’ez, South Arabian alphabet, was then translated in Greek as “Aethiopia”. Tiya is located in the Soddo Region of Ethiopia. 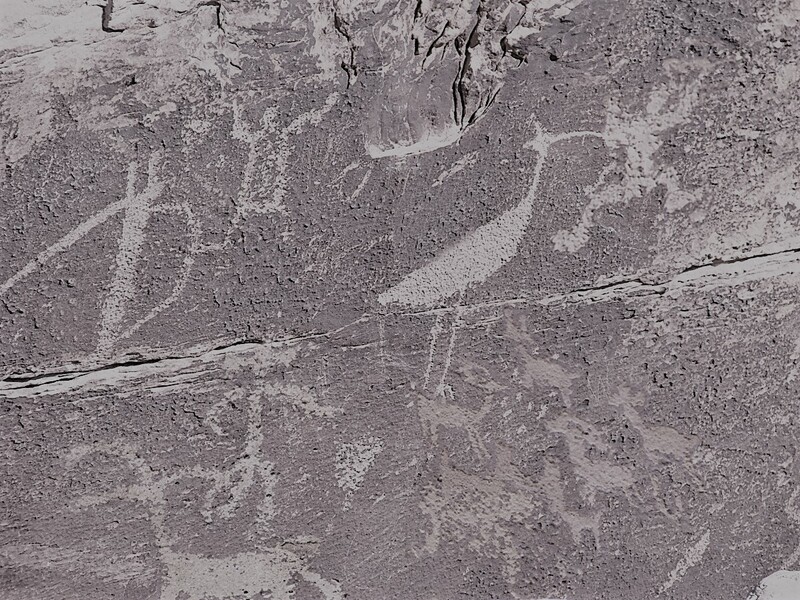 It is best known for its archaeological site; Surface finds at Tiya contained a selection of Middle Stone Age tools (MSA) that are technologically similar to tools found at Gademotta and Kulkuletti. Scientists have unearthed and dated some of the oldest stone hand axes on Earth. The ancient tools, unearthed in Ethiopia in the last two decades, date to 1.75 million years ago. 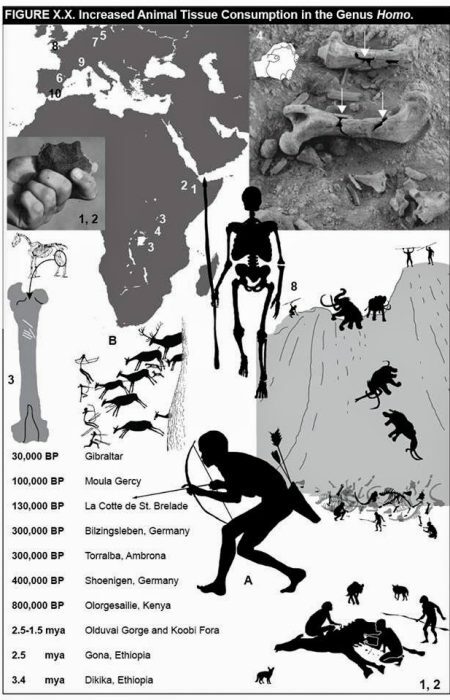 The tools roughly coincided with the emergence of an ancient human ancestor called Homo erectus, and fossilized H. erectus remains were also found at the same site, said study author Yonas Beyene, an archaeologist at the Association for Research and Conservation of Culture in Ethiopia. Collectively, the finding suggests an ancient tool-making technique may have arisen with the evolution of the new species. Aksum was the name of a city and a kingdom which is essentially modern-day northern Ethiopia (Tigray province) and Eritrea. Research shows that Aksum was a major naval and trading power from the 1st to the 7th centuries C.E. As a civilization it had a profound impact upon the people of Egypt, southern Arabia, Europe and Asia, all of whom were visitors to its shores, and in some cases were residents. Aksum developed a civilization and empire whose influence, at its height in the 4th and 5th centuries C.E., extended throughout the regions lying south of the Roman Empire, from the fringes of the Sahara in the west, across the Red Sea to the inner Arabian desert in the east. The Aksumites developed Africa’s only indigenous written script, Ge’ez. They traded with Egypt, the eastern Mediterranean and Arabia. 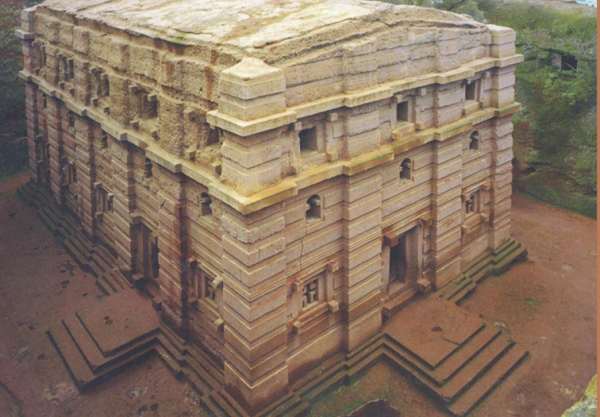 Aksum embraced the Orthodox tradition of Christianity in the 4th century (c. 340–356 C.E.) under the rule of King Ezana. The king had been converted by Frumentius, a former Syrian captive who was made Bishop of Aksum. 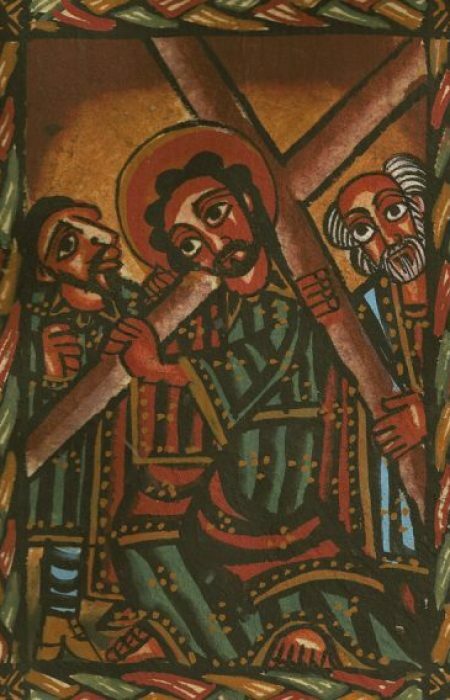 On his return, Frumentius had promptly baptized King Ezana, who then declared Aksum a Christian state, followed by the king’s active converting of the Aksumites. A bronze scepter or wand has been discovered at Atsbi Dera with an inscription mentioning “GDR of Axum”. 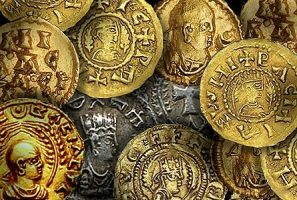 Coins showing the royal portrait began to be minted under King Endubis toward the end of the 3rd century. By the 6th century, King Kaleb was recognized as a Christian by the emperor Justin I of Byzantium (ruled 518–527) when he sought Kaleb’s support in avenging atrocities suffered by fellow Christians in South Arabia. This invasion saw the inclusion of the region into the Aksumite kingdom for the next seven decades. 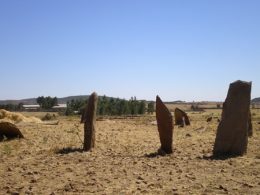 Despite its power and reputation—it was described by a Persian writer as one of the four greatest powers in the world at the time—very little is known about Aksum. Written scripts existed, but no histories or descriptions have been found to make this African civilization come alive. The fall of the Aksumite kingdom of Ethiopia toward the end of the 10th century A.D. was attributed to a queen who invaded from the south. 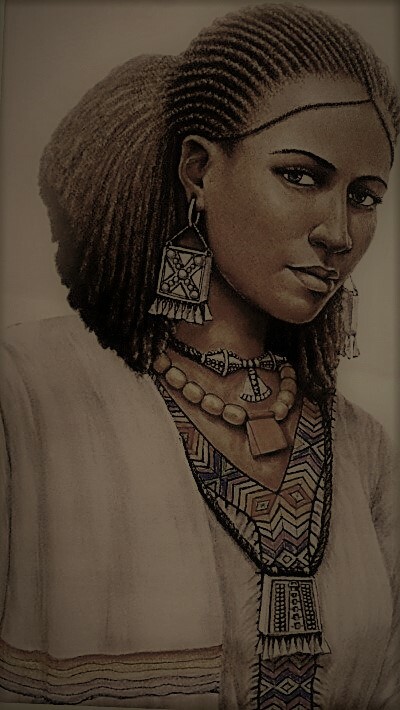 This queen is said to have laid waste to the city of Aksum and the countryside, destroyed churches and monuments, usurped the throne from the ruling Aksumite king, and attempted to wipe out the remaining members of the royal family. Yet, this queen is a great mystery, and opinions about her vary from one scholar to another. Carlo Conti Rossini first proposed that the account of this warrior queen in the History of the Patriarchs of Alexandria, where she was described as Bani al-Hamwiyah, ought to be read as Bani al-Damutah, and argued that she was ruler of the once-powerful kingdom of Damot, and that she was related to one of the indigenous Sidamo peoples of southern Ethiopia. This would agree with the numerous references to matriarchs ruling the Sidamo polities. The rock church of Abreha and Atsbeha in eastern Tigray is intricately carved ceiling was blackened by soot. Gudit had piled the church full of hay and set it ablaze in the 10th centuries . 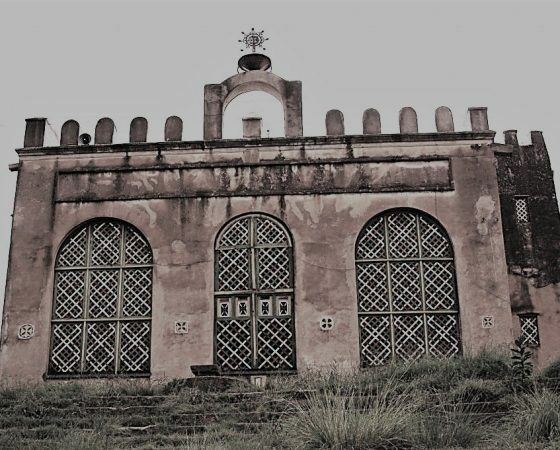 There is a tradition that Gudit sacked and burned Debre Damo, which at the time was a treasury and a prison for the male relatives of the king of Ethiopia. If Gudit did not belong to one of the Sidamo peoples, then some scholars, based on the traditions that Gudit was Jewish, propose that she was of the Agaw people, who historically have been numerous in Lasta, and a number of whom (known as the Beta Israel), have professed an Israelite pre-Ezra Judaismsince ancient times. 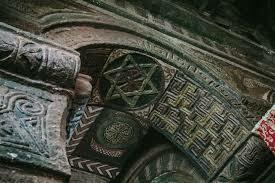 If she was not of Hebrew, Israelite or Jewish origin, she might have been a convert to Judaism by her husband, or pagan. As Christian shipping disappeared from the Red Sea, Aksum’s towns lost their vitality. But Monastic establishments moved even farther to the south. A major church was founded near Lake Hayk in the 9th century. 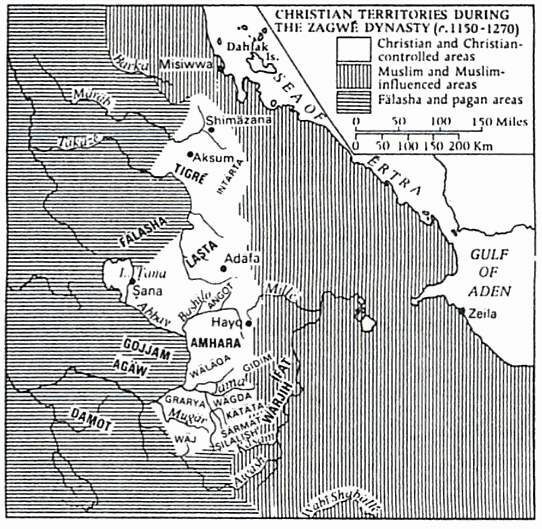 Over time, one of the subject peoples, the Agau, learned Geʿez, became Christian, and assimilated their Aksumite oppressors to the point that Agau princes were able to transfer the seat of the empire southward to their own region of Lasta. Thus, the Zagwe dynasty appeared in Ethiopia. 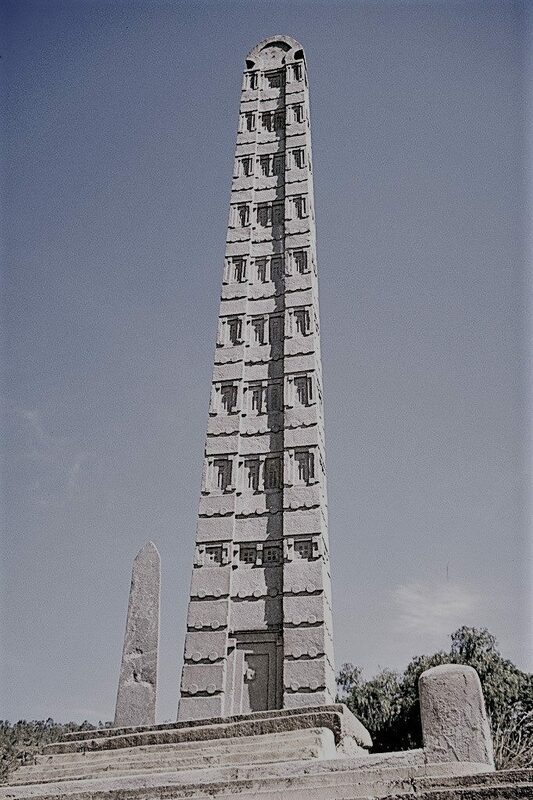 Zagwe dynasty, also spelled Zague, line of 12th- and 13th-century Ethiopian kings who combined a nomadic military life with an impassioned desire to build monuments to their Christian religion. Their tenuous pretensions to succession, based on a legendary marriage to a daughter of one of the last Aksumite kings, the line they deposed, was subsequently confirmed by the church; in return for its support, liberal royal endowments were granted. By the time of the Zagwe, the Ethiopian church was showing the effects of long centuries of isolation from the larger Christian and Orthodox worlds. After the seventh century, when Egypt succumbed to the Arab conquest, the highlanders’ sole contact with outside Christianity was with the Coptic Church of Egypt, which periodically supplied a patriarch, or abun, upon royal request. Descended mainly from the Agau (Agaw, or Agew) people, the house of Zagwe originated in the district of Bugna, and its kings moved the administrative capital to Roha (now named Lalibela), in the safety of their native Lasta Mountains. The Zagwe kings ruled much of what is now northern and central Ethiopia, but any pretensions they may have had to control the hilly country east of the Shewa Plateau lapsed as the region was increasingly occupied by such Muslim states as Ifat and Hadya. The Zagwe dynasty controlled a smaller area than the Aksumites or the Solomonic dynasty, with its core in the Lasta region. The Zagwe seem to have ruled over a mostly peaceful state with a flourishing urban culture, in contrast to the more warlike Solomonids with their mobile capitals. The Zagwe achieved ‘a degree of stability and technical advancement seldom equaled in Abyssinian history’. 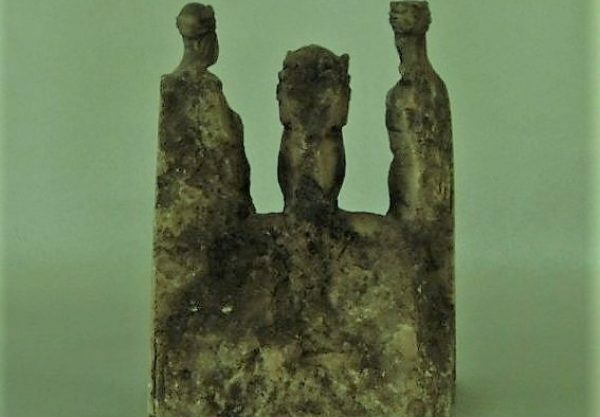 The church and state were very closely linked, and they may have had a more theocratic society than the Aksumites or Solomonids, with three Zagwe kings being canonized as saints and one possibly being an ordained priest. Lalibela, the best-known Zagwe emperor, ruled at the beginning of the 13th century and is known for building the monolithic rock-hewn churches at the Zagwe capital. 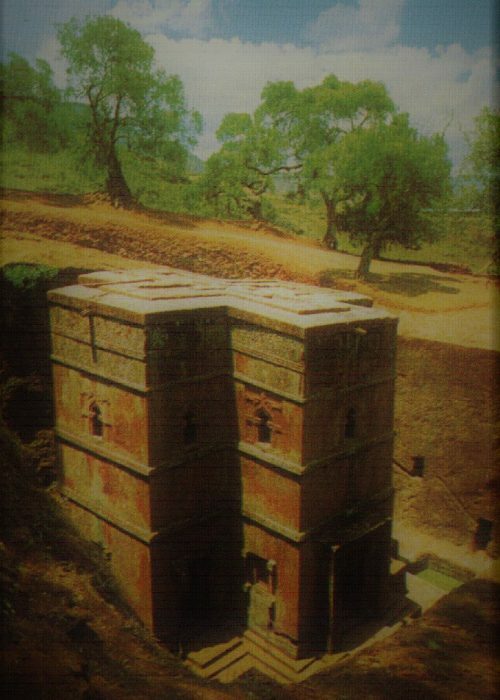 King Lalibela also known as Gebre Mesqel made Roha his political city. According to the legend the saintly king was named so, because a swarm of bees is said to have surrounded him at his birth, which his mother took as a sign of his future reign as Emperor of Ethiopia. 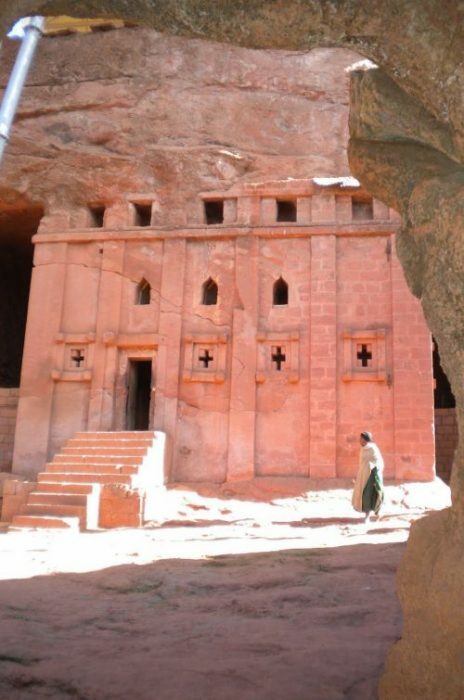 The names of several places in the modern town and the general layout of the rock-cut churches themselves are said to mimic names and patterns observed by Lalibela during the time he spent as a youth in Jerusalem and the Holy Land. perhaps that was darkest times for the Zagwe dynesty. The name of the last Zagwe king is lost — the surviving chronicles and oral traditions give his name as Za-Ilmaknun, (“The Unknown, the hidden one”), employed soon after his reign by the victorious Solomonic rulers in an act of damnatio memoriae. According to scholars and legend the last ruler was actually Yetbarak. Unlike the Aksumites, the Zagwe were very isolated from the other Christian Nations, although they did maintain a degree of contact through Jerusalem and Cairo. 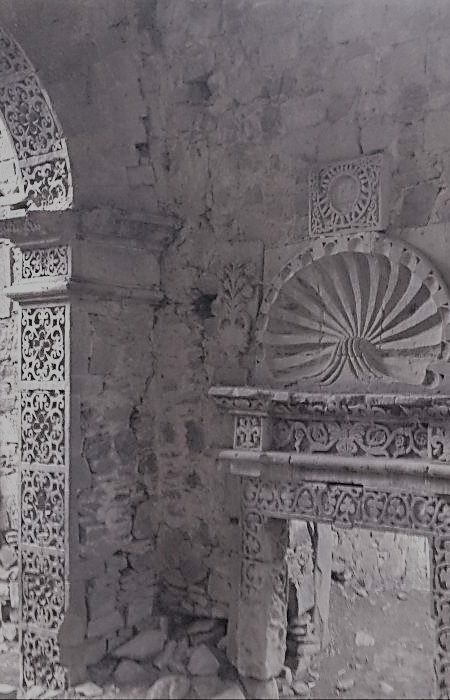 Like many other nations and denominations, the Ethiopian Church maintained a series of small chapels and even an annex at the Church of the Holy Sepulchre. Saladin, after retaking the Holy City in 1187, expressly invited the Ethiopian monks to return and even exempted Ethiopian pilgrims from the pilgrim tax. 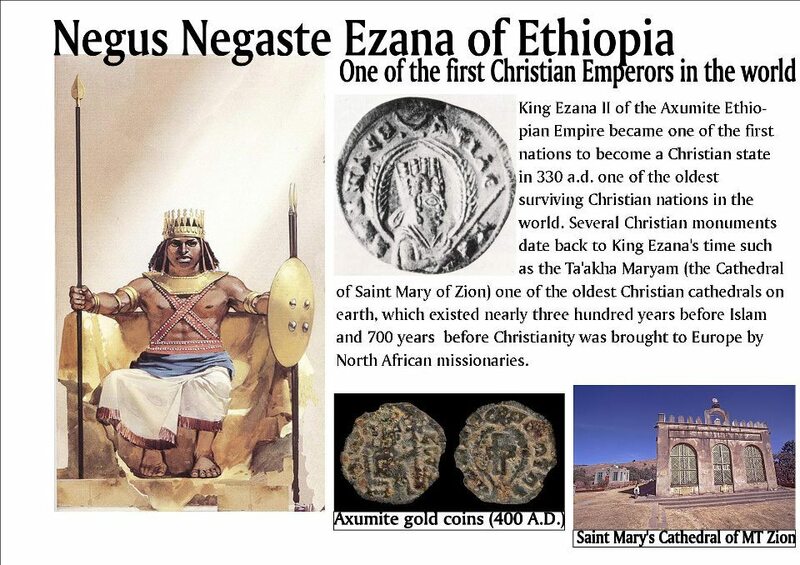 His two edicts provide evidence of Ethiopia’s contact with these Crusader States during this period. 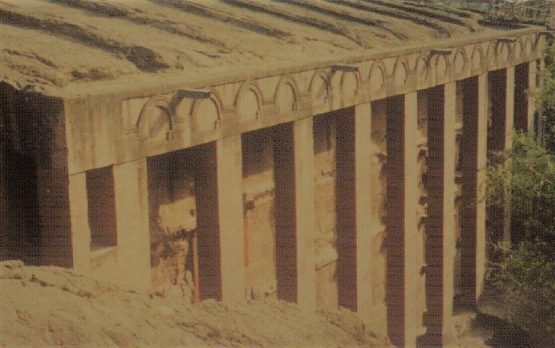 It was during this period that the Ethiopian king Gebre Mesqel Lalibela ordered the construction of the legendary rock-hewn churches of Lalibela. Later legends, modifying the circumstances of the Zagwes’ overthrow, attribute much importance to Yasus Moa, a monk who founded a community in the region of Lake Haik and who, the legends maintain, greatly influenced Yekuno Amlak in his bid for the throne. Yasus Moa pursued the last king of the Zagwe and killed him at the church of St. Qirqos in Gaynt on the north side of the Bashilo River. The usurpation of the throne and the murder of the king are obscured still further by later legends, which tell how another monk, Tekle Haimanot, persuaded the king of Lasta to abdicate in Yekuno Amlak’s favour. 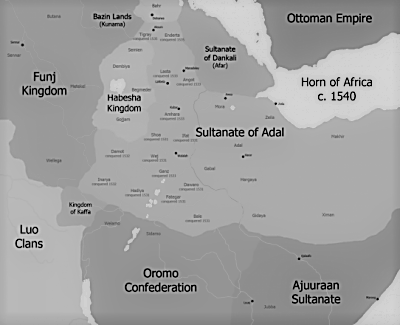 The Solomonic Dynasty (or Solomonic Restoration) is a period of history in Ethiopia between 1270 to 1636. It is so called because, in 1270 when Emperor Yekuno Amlak became emperor and he declared to be the lineal descent of Menelik I, son of King Solomon and Queen Sheba, he ended the short lived rule of the Zagwes off of Ethiopia. Under the Solomonic dynasty, the chief provinces became Tigray (northern), Amhara (central) and, Shewa(southern). The seat of government had usually been in Amhara or Shewa, the ruler of which, calling himself nəgusä nägäst, exacted tribute, when he could, from the other provinces. The title of nəgusä nägäst was to a considerable extent based on their alleged direct descent from Solomon and the queen of Sheba. Under the early Solomonic dynasty Ethiopia engaged in military reforms and imperial expansion which left it dominating the Horn of Africa, especially under the rule of Amda Seyon I. There was also great artistic and literary advancement at this time, but also a decline in urbanisation as the Solomonic emperors didn’t have any fixed capital. Under the early Solomonic dynasty monasticism grew strongly. 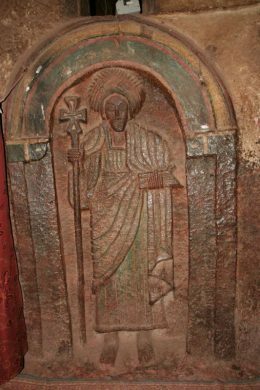 The abbot Abba Ewostatewos created a new order called the Ewostathians who called for reforms in the church, including observance of the Sabbath, but was persecuted for his views and eventually forced into exile, eventually dying in Armenia. The movement grew strong enough that the emperor Dawit I legalized their observance of the Sabbath and proselytization of their faith. Finally under Zara Yaqob a compromise was made between the new Egyptian bishops and the Ewostathians at the Council of Mitmaq in 1450, restoring unity to the Ethiopian church.